Wonderful Views w/ Large Balcony; available Mother's Day Weekend! Bedroom Features:: Master Bedroom: Spacious master with a wonderful view of the ocean, beach and resort grounds. Bedroom features a king bed with an incredibly comfortable plush mattress. Spa–like private bathroom with walk-in shower and double sink vanity makes getting ready a breeze. Master suite also features a hanging closet and a 32” HDTV with cable and a DVD player. Queen Bedroom: Spacious and bright bedroom featuring all new premium Queen suite furniture including an incredibly comfortable plush mattress. Queen bedroom also features a hanging closet and a 32” HDTV with cable. Bunk Bedroom: A fun, bright ocean-themed bedroom featuring two bunk beds that sleeps four comfortably with room left over. Directly across from the 2nd shared bathroom for easy access. This room provides an 8th floor view of the bay and the Queen Isabella Causeway. Safety features include permanently attached ladders and guard rails for the top beds to please even the most cautious. Living Area Features:: Kitchen: Spacious and open with all new stainless steel appliances including a refrigerator with ice maker, glass-top range, large microwave oven and dishwasher. Kitchen is also extensively equipped with all the other necessities such as an excellent beverage blender, coffee maker, toaster, a variety of cookware and cooking utensils, glassware, dinnerware, and flatware. Large countertop and bar area with bar stools. Dining Room: Seating for 6 at a new glass-top dining room table with a view of the great outdoors or the 50” flat screen HDTV. Living Room: Comfortable indoor lounging space for the group featuring an inviting plush couch, loveseat and occasional chair. This space provides direct view of the 50” flat screen HDTV or the outdoor beach scene. Other Features:: Balcony: A wonderfully large and relaxing space providing excellent views of the ocean, beach and resort amenities. Big enough for a party or lazy eating for 8 with totally unobstructed views of the ocean, main pool, tennis courts, poolside bar and resort grounds. Other: Washer/Dryer located on same floor just steps away. In addition, towel/sheet switch out service available for no additional charge… just drop towels/sheets off at service less than a mile away and pickup clean ones (once a day max). towel switch out service available for no additional charge…just drop towels off at service less than a mile away and pickup clean ones (once a day max). located on same floor just steps away. all new stainless steel appliances including an all important Ninja beverage blender. (3) 50" HDTV w/Blu-ray in the Living room, 32" HDTV w/DVD in the Master and a 32" HDTV in the Queen room. very large with ample seating and fabulous views. Lori was a great host. The location was fabulous, family friendly and plenty of room for everyone. The balcony that looks out to the Gulf made the stay even better. We had a wonderful trip to South Padre! It was so nice to be so close to the beach! The condo was nice and spacious. We didn't cook a lot there, but it had everything we needed for what we did prepare there. There were minor things that could be better maintained, like the door lock that goes to the patio is rusty and detoriating, and got stuck once, etc, (small things), but nothing that would prevent me from staying here again. Wonderful view! We enjoyed the amenties at the resort too. The owner was easy to work with and quick to respond to questions. Perfect! We’re looking forward to coming again next summer. Condo was great! Very clean and comfortable. No complaints. Hope to be back next year! The Saida complex is a gated community with lots of amenities. 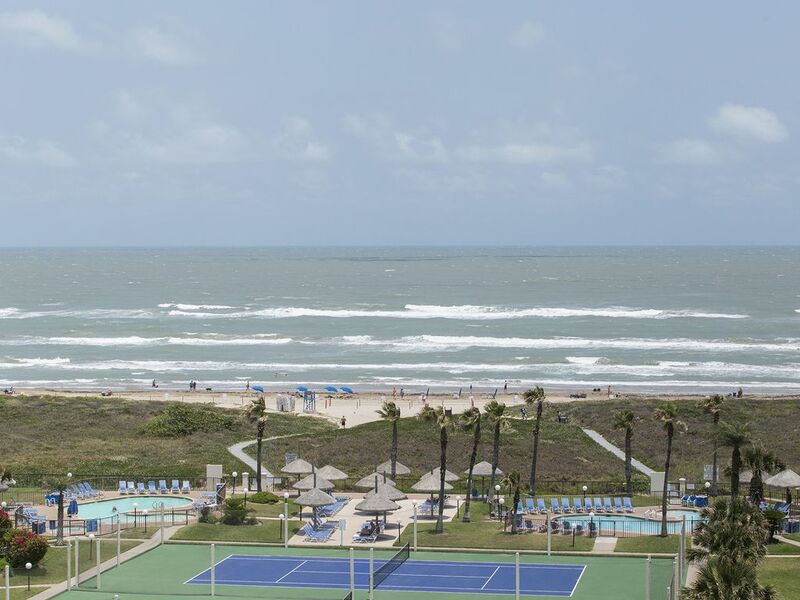 You can explore the sand and surf, the 3 pools, hot tubs, shuffle board and tennis courts. Bring your own equipment or rent onsite for a nominal fee. There is also a seasonal poolside bar with kid friendly snacks. If you want a break from the beach, some of our favorite outings are to the Turtle Rescue Center, the Birding Center, bay fishing and the lighthouse in Port Isabelle. There are also lots of great reasonable priced restaurants. Locals love Manual's (cash only & closed on Monday) or Cafe Isabel for breakfast and Marcello's, Pirate's Landing or Dirty Al's for lunch or dinner. No tax on stays of 30 days or greater. Slight increase on rates for stays that include a major holiday. A longer minimum stay may be required over a holiday or if a stay will leave "open" dates between traveler stays. Spring Break - Saturday to Saturday only, must also purchase wrist bands ($28 ea) from HOA good for stay minimum 4 night stay required over major holiday During busy times (Spring Break, Easter, Memorial Day, July 4th) the building's HOA may require guests to purchase wrist bands (approx. $28 each for length of stay) to denote that they are a guest staying on the property. These extra funds are used to pay for additional security and cleanup crews.